What's the color of money? Green. And what's a better way to get down to business and get that money than with our Green #10 Business Plastic Envelopes? You'll feel rich even before getting the money you deserve! Slightly larger than your standard envelope, these Green 5 1/4 x 10 Envelopes are great for storing bulky documents, important work papers and other notes you’d prefer to keep in a container which can stand more than your average paper envelope. With a plastic finish and secure closure, you won't have to worry about the money you've been saving up in there, every bill will be protected. 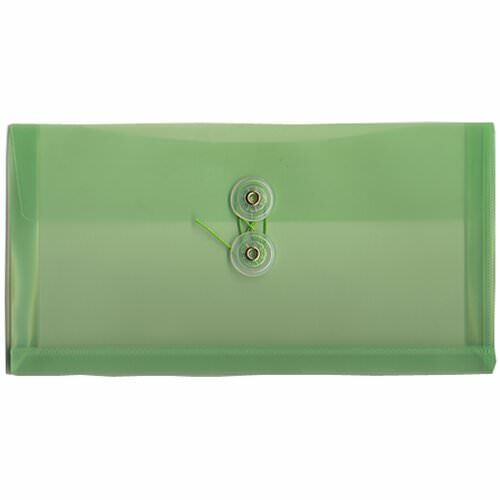 Green #10 Plastic Envelopes measure in at 5 1/4 x 10 and are available in four options: Lime Green Zip with 1 Inch Expansion, Green Button and String, Lime Green Button and String, and Lime Green with Velcro® Brand Closure. Love the plastic but want another color, maybe even another size? Check out our wide selection of Plastic Envelopes located on the left.